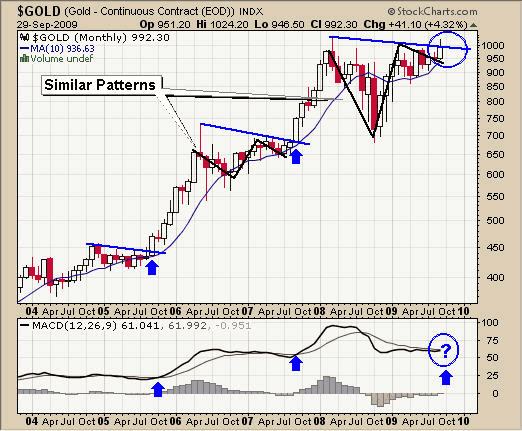 We have been waiting for gold to breakout above the 2008 high for almost 2 years. These charts show we are slowly working our way there. 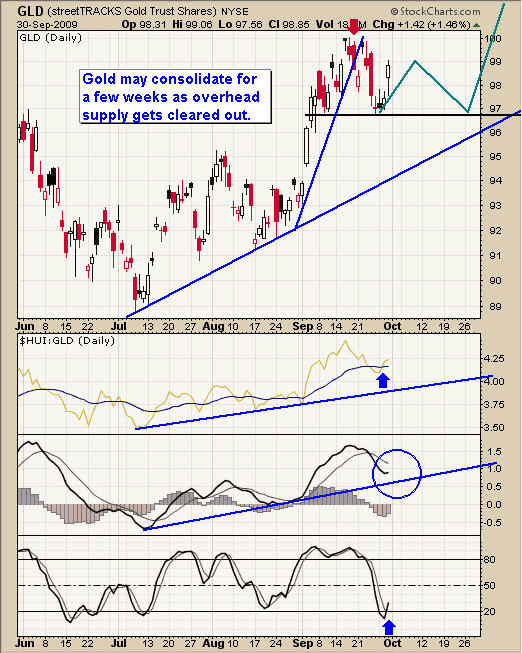 I watch the price of gold stocks very closely because when there is large divergence from the price action of gold bullion I can get in a trade before the general public does. Tuesday we saw gold stocks put in a powerful rally yet gold bullion did not move much. This told me there was going to be some positive action Wednesday in gold and there was a very nice rally, indeed. 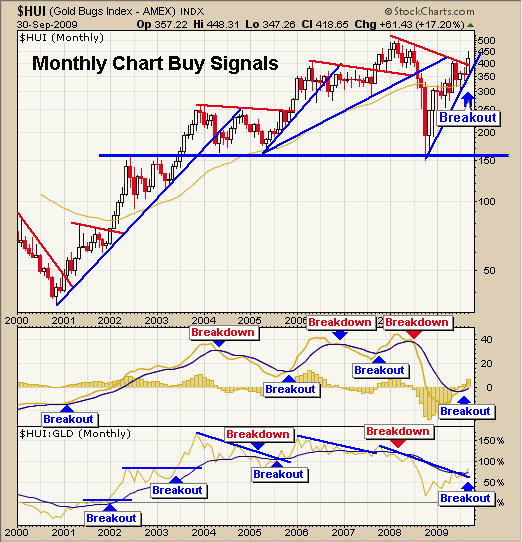 This monthly chart of gold stocks shows a monthly breakout which is exciting to see. Most rallies last between 3-6 months on a breakout like this. That being said we could still have another 1-3 months of sideways price action as gold bullion tries to clear out the over head supply. 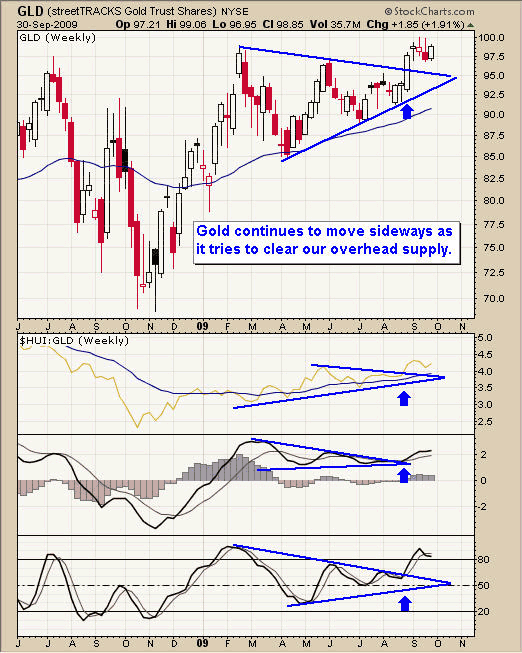 The gold chart clearly shows that we are near a major breakout. You can also see the similar price action before the last major breakout which is encouraging. Gold has broken out of is bullish pennant and now trying to break through the overhead resistance. So far the price action is strong but do not expect a breakout instantly. The market always has a way of dragging things out much longer than one may anticipate. The daily chart clearly shows that if we continue to form a bull flag or some type of pennant formation it major breakout could takes weeks from here. 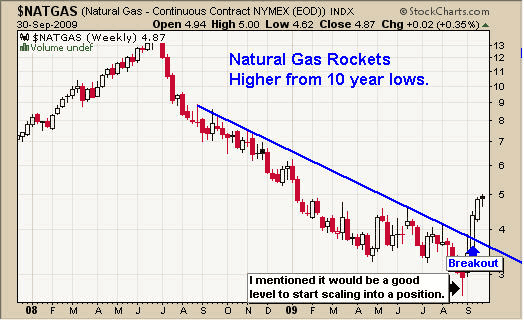 Several weeks’ back I pointed out that Natural Gas was extremely over sold and at 10 year lows which was a good point to start scaling into a position. This high risk setup has paid off well for those following actively trading the over bought and over sold conditions with me. We now have a breakout and are waiting for a low risk entry point to buy more natural gas. 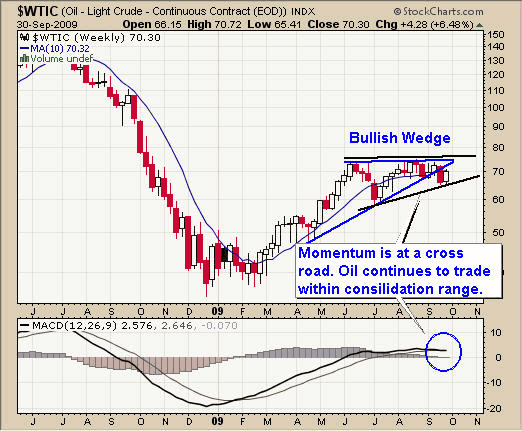 Crude oil continues to trade within a set of bull wedges making it difficult to get a low risk setup. I trade over bought, over sold and trends, not sideways/trend less investments which USO has been in my eyes for a few months. Soon enough it will flash a buy or sell signal for me and we will be active again with USO and other oil funds. Overall our precious metal stocks and bullion trades are doing well. We continue to wait for a breakout, hopefully to the upside, but have protection stops in place to lock in gains if prices drop on us. The energy sector has been tricky because oil is trend less and natural gas has gone straight up. Again my focus is on low risk, high probability trades and I don’t chase or make trades when there is nothing to trade. Chris Vermeulen is Founder of the popular trading site TheGoldAndOilGuy.com. There he shares his highly successful, low-risk trading method. For 6 years Chris has been a leader in teaching others to skillfully trade in gold, oil, and silver in both bull and bear markets. Subscribers to his service depend on Chris' uniquely consistent investment opportunities that carry exceptionally low risk and high return.